The world would be much gloomier a place without Lars Hollmer. The Swedish composer, accordionist and keyboard player was the key force behind the legendary Samla Mammas Manna and has over the last quarter of the century developed a unique melodist vocabulary, drawing inspiration from both European folk music and baroque. 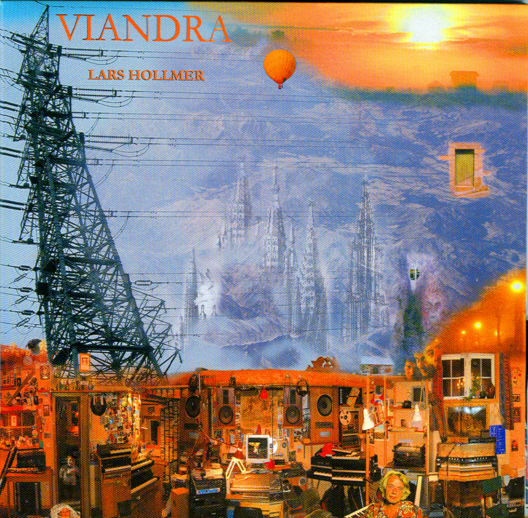 Holed up in his “Chickenhouse” home studio in Uppsala, Hollmer has regularly brought to Nordic light series of highly successful accordion miniatures. Whether in stately fugues and cantatas, jolting polkas and farandoles, rapid scherzos and capriccios or pensive lullabies and bagatelles, Hollmer’s final synthesis remained highly original and instantly appealing. Despite his frequent references to the traditional dances of the European north, the relative paucity of direct quotations has kept him apart from the Scandinavian folk renaissance of the last 15 years. Some of Zamla’s fans reproach Hollmer for not replicating the band’s sound more faithfully. But Zamla was always more than just Lars Hollmer. His solo records lack the band’s contorted time signatures, contrary motions, Coste Apetrea’s guitar twitches or extended, mirthful extemporations. Still, Hollmer’s recordings more than compensate for that with cliché-free emotional content and open minded attitude to a variety of musical traditions. This is not the first time that Hollmer opens his record witch such an unassuming, feathery tune. His accordion knits slow, reedy gables. Harmonic mellotronics materializes, setting the stage for middle register, consonant melodic line. But the gracefulness of the piece distracts from the otherwise unstable periodicity of the epicycles carrying not one, but several charming sub-themes. This time mellotronics invites us to a poignant waltz. Hollmer’s accordion merely serves harmonics. The piece stays afloat, eerily tinged with 1940s’ tenebrism. The track begins with a low-key glockenspiel, then moving on to a full quartet sound. Michel Berckmans enters on stately, silicate English horn, joined by Santiago Jimenez on violin and Andreas Tengberg on cello. The isostatic character of the piece first smacks of distant memories of a music school, save for the seasoned pizzicato. The band burgeons in an atmosphere of serenity, later carmelizing into decorative baroque quatrefoils. In a radical change of pace, “Snabb” introduces high volume, bass-laden digital drum setting for a melodica and accordion line. In turn, the subsequent transition will draw on Miriodor-like, keyboard-led neo-classicism. The rest of the piece is be filled by the contrasting alteration between the drum episode (courtesy none other than Morgan Agren of Mats & Morgan fame) and the classicizing keyboard answer. Towards the end, the robust pummeling will be enriched by tinny, hollow kalimba touches. This track was apparently inspired by a Moldavian girl who appeared in a movie to which Hollmer wrote a score. A short divertimento for accordion, melodica and acoustic piano proves Hollmer’s willingness to constantly refresh his format with new sources of folk inspiration. A wistful, songlike cavatina of highest caliber. It is delivered camminando with the basic bass line from the keyboard bass, and the melody spinning through melodica. Ulf Wallander on tenor saxophone adds some agility to lower registers, enhancing the bass line. This is one of the most romantic moments on this record. The full quartet returns with strings and accordion interplay – a format that can scarcely escape comparisons to Astor Piazzolla’s legendary dramaturgy. Glockenspiel and keyboards are in clear lead, hosting a concordant, ashy veil of bassoon, cello and violin. A double of violin and accordion paint a theme that hangs over like cirrocumulus. This could easily qualify for Hollmer’s another film score. Piano and melodica open in a gentle, tender, optimistic tone. This is Hollmer’s well-trodden format – first the exposition without the bass line and then the primary theme repeats it with the support – this time performed by Berckmans’ organic bassoon. The piano will provide some variation before fizzling out. A trio with bassoon and violin. The track’s rhythmic mobility converges on melodica’s excesses – well supported here by the bassoon. Then, a surprise transition leads to an eerily familiar, ecstatic melodic adventure. On the way down, the more prominent violin provides a welcome textural enrichment. The non-linear seams that tie together the hummable refrain will probably exclude “Konstig” from the radio, but otherwise its bold and swinging panache would beat commercial melodists hands down. A stately, contrapuntal fughetta with Berckmans on bumblebee bassoon. Its glyptic polyphony is appropriately artful and elegant. A polka written for accordion and melodica. It throws us back to Hollmer’s hard-driven folk dances from his early LPs. Even if the intention is a little facetious, the resulting jumpy repetition is ludic and frivolous. This delicate berceuse cradles us with mandolin and random cuckoo vocals from Hollmer’s three granddaughters. The multi-focal arrangement of vocalizations and the choice of flocculent instrumentation bring to mind some of Albert Marcoeur’s more lyrical moments. Violin and cello slog along chained in some doomed pilgrimage. This is another baroque piece, quiet and solemn. The initial ricercar sets the key for the bleak string development – somewhat reminiscent of Univers Zero’s metaphysical dirges. We wake up from the nightmare into a happy sunrise serenade. Hollmer’s granddaughter officiates here in a “singing” part, thanks to the author’s innocuous nepotism. Luckily, Zamla’s Coste Apetrea provides some assistance on mandolin. It is full of sparkling, youthful optimism. Hollmer’s introspective string samples set up Jimenez to perform a love call which sounds like a Hungarian gypsy whine. Somber, cheerless shadows are cast against an unobtrusive sampled chorus and a poignant cello line. This quiet composition is marvelously evocative but at the same time pleasantly restrained. This much earlier track has been added to round off the entire set on a more optimistic note. A simple dance played by Lars on accordion and keyboards possesses parameters of a polka – the quintessential accordion dance. Yet some of the keyboard developments are unmistakably Hollmerian and when he begins to spin around, it could just as well be Colombian cumbia. The artist is such an emporium of themes that this array of influences turns each dance into a highly idiosyncratic proposition. There is only one Lars Hollmer. Until the very recent appearance of the supreme “Viandra”, it was position 4 that was most often drawn from the shelf. However, 2, 3 and 5 are equally recommended. Positions 1 and 8 are live performances of two different bands – extremely lively and brimming with cheerfulness to clear up any gloomy day. Both 1 and 9 make extensive use of traditional themes. From position 7 onwards, Hollmer spent a lot of time digging into his considerable inventory and inevitably some peripheral sketches crept into the public domain. Positions 14 and 15 are artistic résumés transposed onto a micro-Japanese and macro-Canadian context, respectively. Other recordings labeled by Hollmer or his LHO can be found on various compilations from the 1980s and 1990s: “Ré Records Quarterly Vol.1 No.1”, “Festival MIMI 89”, “Hardi brut”, “Angelica’92”, “Angelica’93”, “Haikus urbains”. He also appeared on numerous recordings of other musicians – Fred Frith, Wolfgang Salomon, Volapük, Miriodor, Guigou Chenevier among them. Naturally, there are also various other recordings of Samla Mammas Manna, Zamla Mammaz Manna and Von Zamla. Sonic Asymmetry will return to these one day with great pleasure. Hollmer is also a member of the international combo Accordion Tribe. His classic compositions belong to the band’s repertoire, showcasing slightly different arrangements. The last of the three CDs is more Hollmer-heavy.